As the first story of Iteration Zero is still in development, I’m messing around and making tweaks to some of the characters as they hit me. 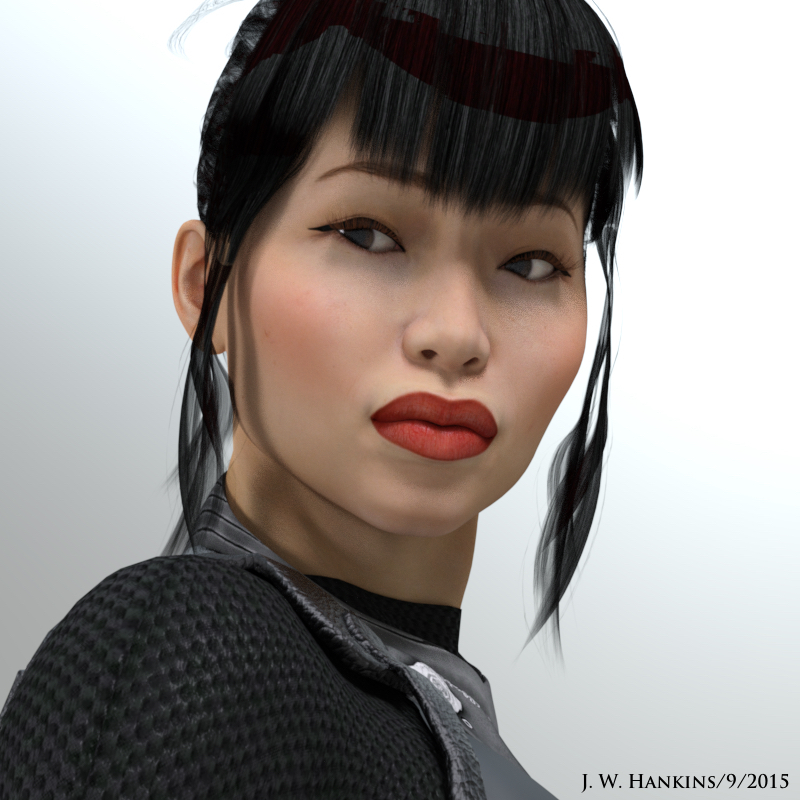 This week, I’ve been working on Miyako, adding/subtracting to her outfit/gear and touching up her face. In the midst of all that, I realized when I introduced her in my first post about Iteration Zero, you all didn’t get a chance to see what her face looked like. Well, here she is. All images are raw renders without any post work. I’ve decided to do away with the scarf covering the bottom half of her face. Why cover up such a pretty thing, right? Miyako is my fourth attempt at “designing” an “Asian Face” from scratch, which I think is pretty good. I added a flex-armor shirt and gave her a multi-purpose weapon: Part cutting laser, part silenced sub-machine gun. Out of her teammates, so far, Miyako is the dare-devil, feisty one, who will literally jump at an impossible challenge…and get it done. As the team’s Scout/Engineer, she’s highly intelligent and usually the first into a situation. I’m sure I’ll go through more changes before everything is finalized, so I’ll be back with more updates, that is, if Miyako doesn’t mind me telling all her business.